TORONTO, ONTARIO--(Marketwire - May 14, 2008) - Western Troy Capital Resources Inc. (TSX VENTURE:WRY) ("Western Troy"), announced today that Western Troy's President, Rex Loesby, and VP of Exploration, Wayne Holmstead, attended a meeting of the Otish Mountain Access Road Committee (OMARC) on April 29, 2008. The purpose of OMARC is to promote the development of an extension of Highway 167 from Temiscamie to the Renard Diamond Project in North-Central Quebec. Rex Loesby, Western Troy's President commented, "OMARC has funded the feasibility process and work will begin this summer. The Committee has scheduled environmental work for 2009 and road construction targeted to begin in 2010. We were encouraged to see all the OMARC participants, including the Town of Chibougamau, the Mistissini Cree, Provincial Agencies, and representatives of private industry working together to generate positive progress on the road. With appropriate and environmentally responsible planning and development, this road can generate significant benefits in the region, the Province of Quebec, and Canada. Western Troy is proud to be an active member of the Committee." 1) A total of $926,000 has been committed for the pre-feasibility study, leaving only $24,000 left to be raised. OMARC Co-Chairman and Mayor of Chibougamau, Don Bubar, indicated the remainder would be raised shortly and that OMARC will contract to begin the pre-feasibility process without delay. 2) An airborne survey contractor will be selected by late May or early June, 2008. 3) OMARC expects to grant a contract for the pre-feasibility study by mid-June, 2008. 4) A field survey, including drilling and sampling to characterize the material along the route as well as to determine bridge sites, should follow in the fall of 2008. The data collected will support the pre-feasibility and will be of sufficient detail to support a final feasibility study. 5) The pre-feasibility study completion is targeted for April 2009 with preliminary results to be available in January of 2009. 6) The Environmental Impact Study (EIS) is targeted to follow in the spring and summer of 2009 with construction following in 2010. 7) Completion of the road is targeted for 2012 contingent on fund raising (see below). 1) Government financing - Development costs incurred for transportation infrastructures, facilities, systems and maintenance might be entirely covered by the government, i.e., either the MTQ or a group of departments and agencies at various levels of government. 2) Government financing followed by industry reimbursement - Development costs incurred for transportation infrastructures, facilities, systems, and maintenance might be covered in whole or in part by the Quebec government with a commitment by beneficiaries to reimburse initial capital and ongoing maintenance costs on the basis of profits generated by the project. 3) Government/Private financing - Development costs incurred for transportation infrastructures, facilities, systems and maintenance might be covered by a company or a promoter, that in turn will be reimbursed on the bases of the user/payer principle or by exemption from fees due to the government, up to the amount equivalent to the initial investment costs incurred. Mr. Blais indicated the MTQ is open to consider a 70 km/hr road with single lane bridges. A road with this specification is expected to be significantly lower in cost that an earlier proposal for a 90 km/hr road. The 70 km/hr road is consistent with the road spur specified in the MacLeod Lake Project Preliminary Assessment. Final design of the OMARC road will depend on user needs and safety issues. There was discussion of the road route. The existing winter road follows a route that is appropriate for a winter road, but may not be suitable for an all weather road as it crosses wetlands and marshy areas. It was suggested that a number of alternate routes further to the west would be less costly and would have less impacts on wetlands. If a more westerly route is chosen, the MacLeod Lake spur length could be significantly reduced. Mr. Jean Gagnon, Quebec's Ministere du Developpement durable, de l'Environnement et des Parcs (MDDEP), provided an update to OMARC regarding the development of the Albanel-Temiscamie-Otish Provincial Park. The OMARC road may pass through the park. Mr. Gagnon indicated that MDDEP agreed with the proposed road crossing through the park and that the road corridor crossing the park will be extracted from the park area. Then there will be no restrictions on trucking that might otherwise be imposed by MDDEP. MDDEP expects to use the road for tourist development of the park. Western Troy Capital Resources Inc. is a mineral exploration company. Its 100%-owned MacLeod Lake Property hosts a well defined Main Zone of mineralization as outlined by extensive drilling. In addition, a South Zone resource and several IP anomalies of potential interest have been identified. 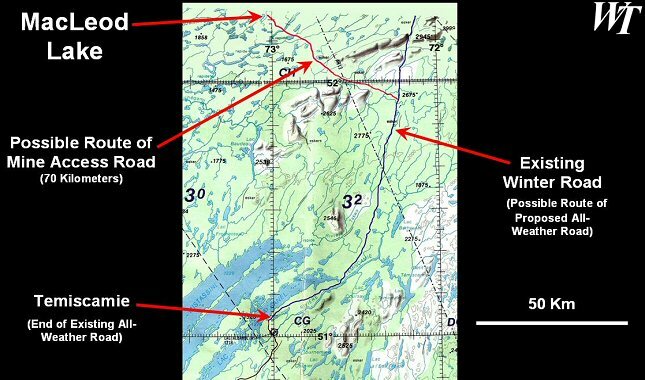 In April of 2008, Western Troy received an independent Preliminary Assessment (Scoping Study) consistent with National Instrument 43-101 on its MacLeod Lake Property located about 275 km north of Chibougamau, Quebec. The report has been filed on SEDAR and is available at www.SEDAR.com and on Western Troy's website, www.WesternTroy.com. Western Troy also has a number of early stage molybdenum and uranium exploration properties in Quebec. The shares of Western Troy trade on the TSX Venture Exchange under the symbol WRY, with 19,550,970 shares outstanding.